Honey buttered rum is the perfect holiday drink! 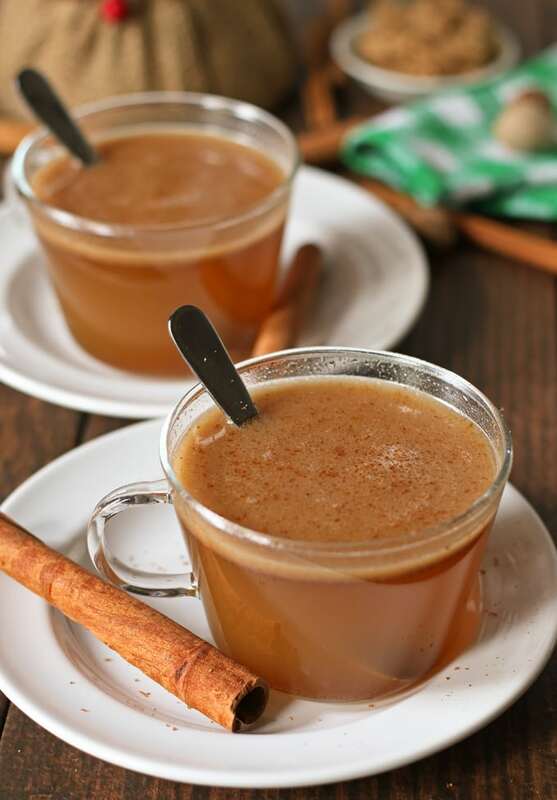 It has all of the warmth and spice of hot buttered rum with the addition of my favorite ingredient – honey! When I was growing up, we knew the holidays were right around the corner when my mom lit our fireplace for the first time. It was just about the weather getting colder; usually the first fire was followed a day or two later with the Christmas boxes being brought out of storage. The second fire of the year was typically lit on the night we would decorate our Christmas tree. We would all gather around the fire, listening to my parents’ Christmas albums and sip on cups of hot chocolate. Years have gone by and as we got older, got married and moved out of the house, traditions have changed. The one thing that hasn’t changed is our ceremonial fire. We gather one day each year to celebrate together, and sit in front of the fire. The music has changed a little and the record player has been replaced by an iPod. And the hot chocolate has been replaced by adult beverages. I’m really excited because this year I am going to be introducing this fun drink – honey buttered rum. If you have any plans over the next few days to sit in front of a fire, then this is the perfect drink for you! My honey buttered rum, made with Tate+Lyle® Honey Granules, is going to be your new go-to winter drink. 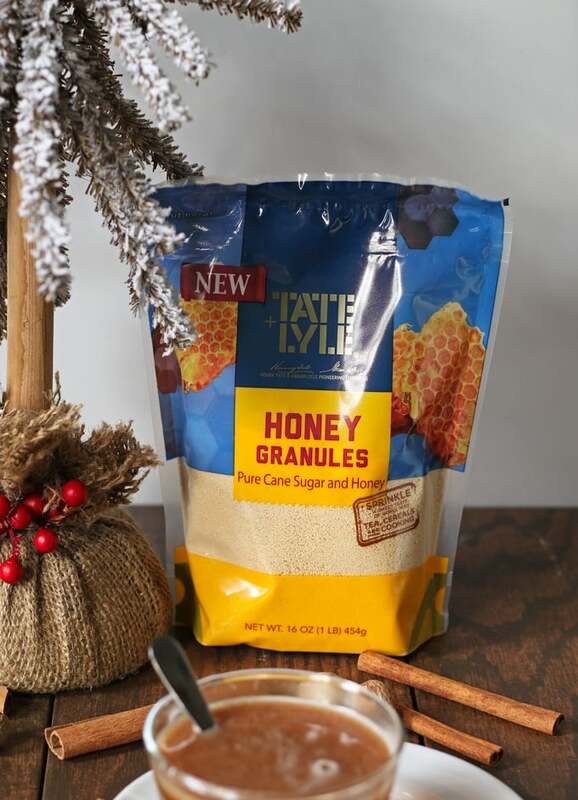 Tate+Lyle® Honey Granules is a free-flowing blend of pure cane sugar and honey. It’s a sweet and easy way to add honey to drinks and baked goods but without all of the stickiness. I just can’t resist anything with honey and this makes the experience so much neater! Honey Granules can be used in so many different types of baked good recipes – either as a substitute for some or all of the granulated sugar called for in a recipe. It will add a touch of that exquisite honey flavor you (and I) love! 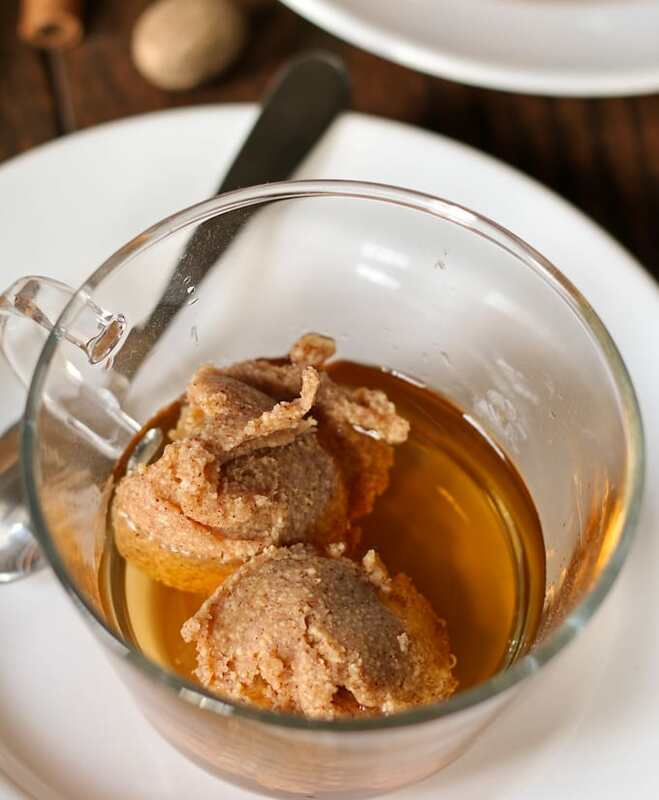 The honey butter is made by mixing softened butter, Honey Granules and spices together. Then simply combine that with spiced rum and boiling water for a delicious, and warming, winter drink! Honey buttered rum is the perfect holiday drink! It has all of the warmth and spice of hot buttered rum with the addition of my favorite ingredient - honey! 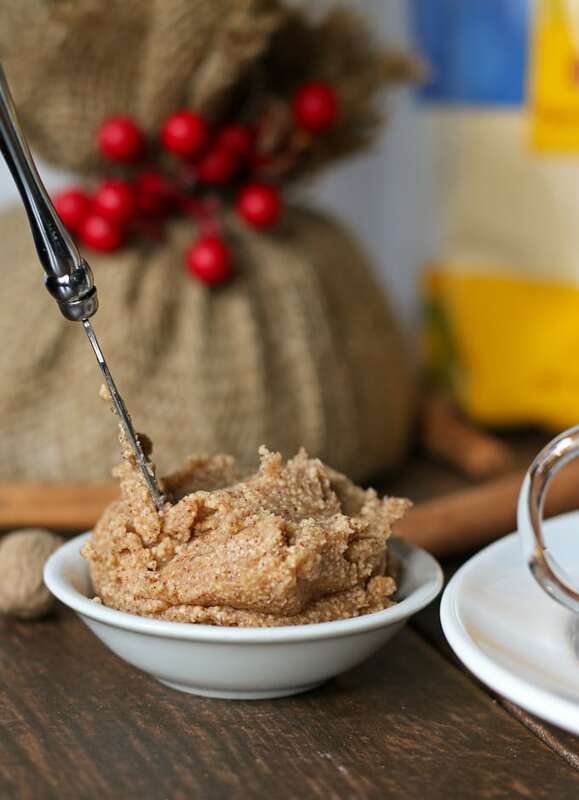 In a small bowl, beat together the softened butter, Tate+Lyle® Honey Granules, cinnamon and nutmeg. 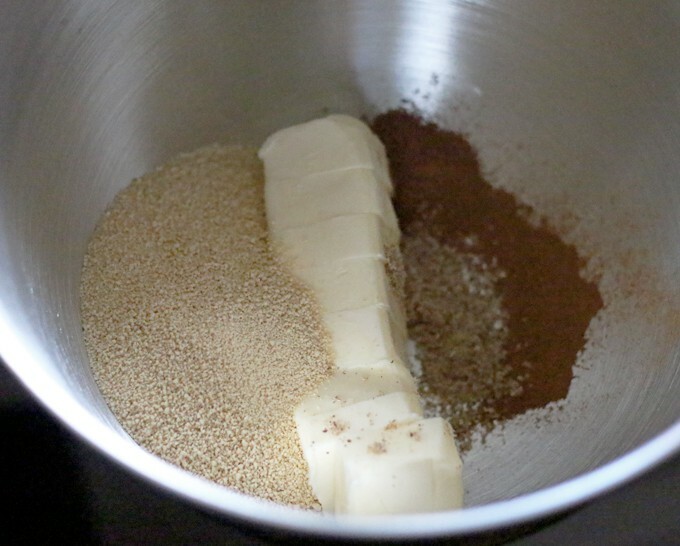 When combined, place butter mixture into a small bowl and refrigerate until firm. 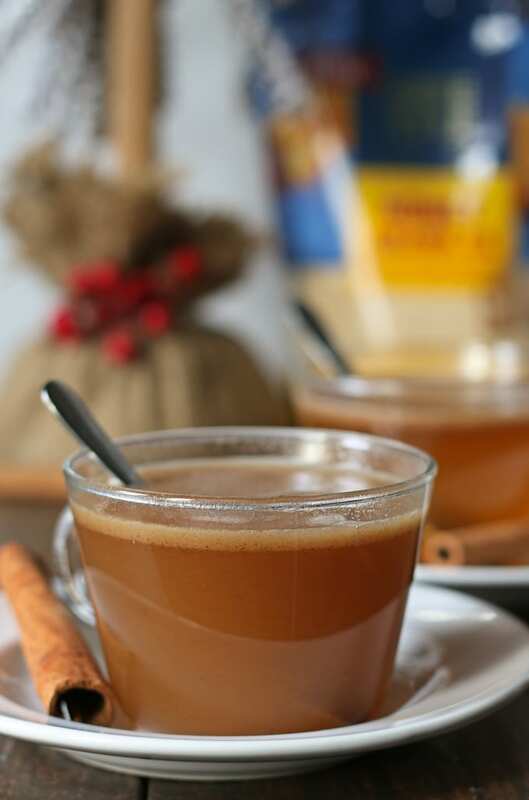 For a single drink, place 2 tablespoons butter mixture and the spiced rum into a coffee mug or teacup. 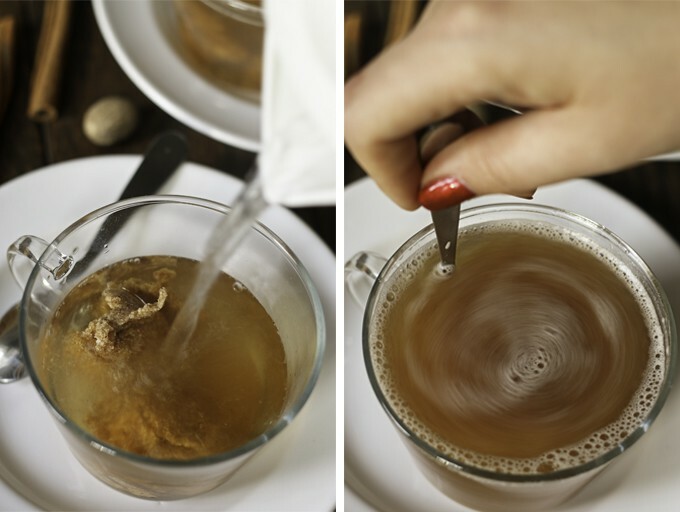 Pour the boiling water over the mixture and stir well until the mixture has dissolved. Honey granules can often be substituted for fluid honey by using the following conversion: 1 cup liquid honey = 1 cup Tate+Lyle® Honey Granules + ¼ cup additional liquid to recipe. To avoid the sticky mess, but still taste the delicious flavor, check out the Tate+Lyle® Store Locator to find Tate+Lyle® Honey Granules at a Walmart near you! I loved reading the story of your fire lightings! And now I’ve got to get my hands on some of these honey granues – I’ve never worked with them before! BTW 0 such a wonderful drink for the holidays! I can’t wait to try this! Such a great addition to the holidays! Sounds great for this time of year! This sounds amazing! You have no idea how much I could go for this right now since I have a sore throat (alcohol helps, right?!) I have never worked with honey granules but I so need to give them a try! They’re really easy to work with – I doubt you would see much difference! OMG honey granules?! I’ve never seen something like that! It’d make delicious honey peanut butter. This drink sounds so lovely! Christmas traditions are the best! This looks like a perfect drink to curl up to the fire with! This looks so rich and flavorful! I love Tate+Lyle and this is the first time I’ve seen the honey granules, will definitely have to check those out! If you’re already a fan of Tate+Lyle, you are going to LOVE the honey granules! I could drink this all year round!! Yum!! Don’t forget to link this up to Tipsy Tuesday at Grey is the New Black! Thanks for the reminder Pam! What a beautiful holiday drink! 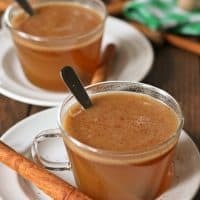 I just made a version of hot buttered rum, but I’m absolutely LOVING the addition of honey in yours! This is so needed right now, it’s -4 outside and I am chilled. This would warm me right up.